Long-recognized by our towering spire, United Church has an equally towering history of committed ecumenical activity, work for justice and service to those in need. These values come to us from our historic roots, which have two main branches: our ancestor congregations in the United Presbyterian and American Baptist traditions. In 1792, Gershom Breed, a Revolutionary War veteran, began leading prayer and meditation gatherings in settlers’ homes, in the then wilderness area which has grown to the contemporary Fayetteville and surround. By 1798 the worshippers had crafted a covenant for their life together and organized formally as a Baptist congregation in 1804. They met in a schoolhouse until 1830, when they built their first building. This was replaced by a larger building in 1872. In that same era, Presbyterians were meeting in the home of David Collin, until, in 1829, they built their first church, complete with clock tower and steeple, in the village. Beginning twenty-years later, they began to gradually expand the building, first adding Beard Lounge and an upstairs office. The two congregations remained collegial but separate until the coal shortage of World War I led them to conduct joint services, alternating use of their respective buildings. In 1933, the congregations decided to make this a permanent arrangement and by agreement, the Presbyterian facility was adopted as the united congregation’s home. The Baptist Church was sold and later razed. The resulting congregation maintained the historic values of their antecedent congregations that had been active in abolition and suffrage for women, among other rights-related issues of their day. United Church has over the years addressed such concerns as the death penalty, hunger, refugee resettlement, treatment of those with disabilities and GLBT rights through its ministry and education programs. Aware of its own ecumenical history, the congregation remains committed to collegial relationships, respect and shared service with people of all faiths, both within and beyond the Christian tradition, believing that we are called to be spiritually hospitable as well as offering concrete acts of welcome and care. Along with the congregation and times, the building has also grown and changed. 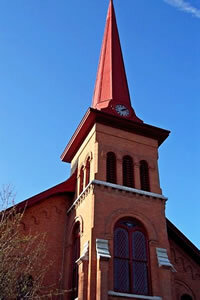 Situated in in the National Historic District of the Village of Fayetteville, its Romanesque architecture, particularly its brick steeple with red spire, is visible from miles away. From Genesee Street, which it faces, the building appears misleadingly small. Yet nearly three stories stretch behind it to the parking lot in the rear. In addition to retaining the 1871 Johnson organ, the church now houses two lounges, up-to-date choir and music facilities, large kitchen, classroom space for all ages, a retreat space, Fellowship Hall, a major accessibility project, and a landscaped Memorial Garden alongside the building. One cannot enter the church without thinking of those who have gone before and who have entrusted this generation with its care. Throughout more than 150 years, the congregation has given sacrificially from God’s gift bestowed on it in order to maintain the building’s historic essence, while not making it a relic of the past. The congregation continues to enhance its facilities to serve the world today. While we consider the building to be a treasure of which we have been made stewards, we believe the building primarily to be the place where we are formed as a community and from which we are prepared for ministry and sent into the world for service. Click here to see additional pictures of our Historic Stained Glass, or here to see Rooms and Scenes in our church.